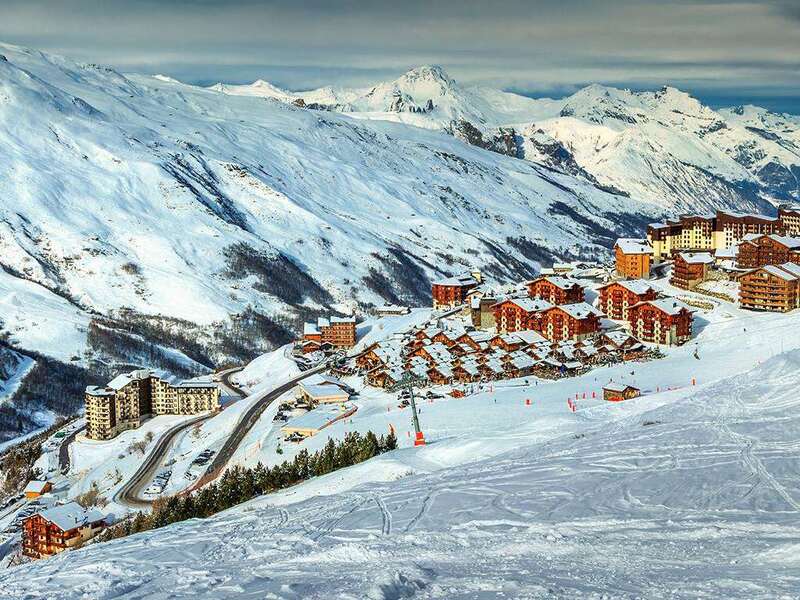 As part of the Mountain Collection, Hotel Le Menuire offers free ski guiding and coaching with fully qualified Mountain Expert ski and snowboard instructors. Various sessions run throughout the week to introduce you to the ski area and improve your technique along the way. Skiers and snowboarders wishing to take part need to be over 18 (or 12 in school holidays) and be good enough to ski down blue and red pistes. You can sign up for the sessions at the hotel on your first day in resort. At the Hotel Le Menuire & Spa it’s set to be our finest hotel you’ll find it in the world-renowned 600km Three Valleys ski area and the wonderful spa has an impressive adventure pool, hot tub and sauna for some après relaxation. The Le Menuire is in a convenient spot as you can virtually ski from the hotel (about 100m away) to the Preyerand lift (about 200m away) and you can ski back to within about 20m of the hotel without having to come out of your bindings. The main hub of Les Menuires, the Croisette area, is around 650m away and from here, the entire Three Valleys is at your feet. After your day on the seemingly endless slopes, head back and spend an afternoon indulging in the adventure pool. You can lose hours in there as it has jet beds, a lazy river and even waterfall. Afterwards, try the sauna and treat yourself to a bit of pampering with a massage or beauty treatment. For the restless, there's a games room to take on friends and family at table football or pool. Or simply head to the hotel bar and salon with its enviable open fireplace after a delicious evening meal and catch up with like-minded souls with a nice glass of red. Each of the 41 rooms here is cosy (but not small), clad with wood and adorned in Fairisle prints for a really warm and homely feel. Many have views over the mountains and some have balconies to enjoy a morning cup of tea or coffee and a moment of calm. There’s a great variety of room sizes to sleep between two and four people comfortably. Each has plenty of storage for your kit and all are equipped with free Wi-Fi, satellite TV, i-Phone dock and ensuite bathrooms with over-bath shower and wc. Our youngest guests will be well catered for with our run childcare and crèches taking care of kids from four months to 12 years old. For skiing kids, we offer a ski school drop-off and pick-up service, ensuring they're happy and settled. There's also evening care available on three evenings a week. Staff in the hotel is 100% committed to great customer service and are super helpful! Food is absolutely amazing, very tasty and good options for everyone! Rooms are comfortable and spacious with great views from the balcony. It’s possible to ski from 50m out the boot room (or a short ski bus ride from outside the main entrance). There is a supermarket close by and hire shop is 1 stop away or a lovely stroll through town! The bar in the hotel is cozy and chilled for an apr&#232;s ski drink! Bars in town are good for a drink as well. The childcare is great, I saw the staff with the kids multiple times doing lots of activities! Relaxing pool and wellness area. For lunch out the staff will give you some amazing options. Great links to the three valleys!